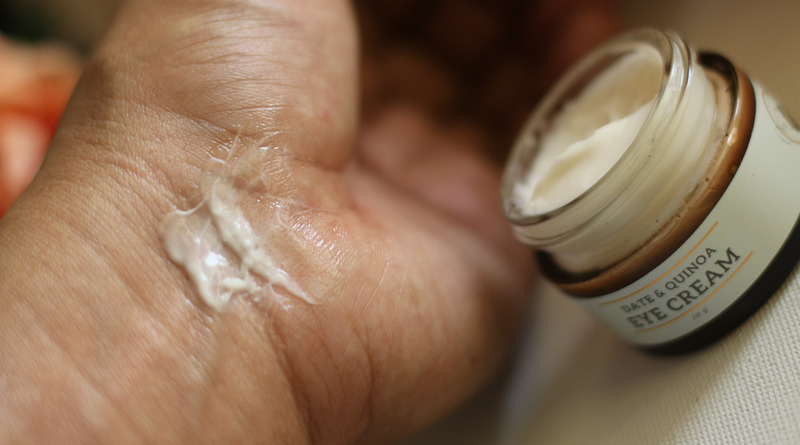 ‘Do we really need to apply an eye cream when we’ve already used a moisturizer’ – I have been asked this question a dozen times by my friends and readers. Well, To answer that – The skin on the eye area is totally different from the skin on rest of our face. Skin under eyes are much thinner, more sensitive and has fewer oil and water glands, so it needs more hydration. While you can use your facial moisturizer on under eye area, it may not be rich & hydrating enough. There comes the necessity of using a product that is specially targeted to moisturize and protect the under eye area. 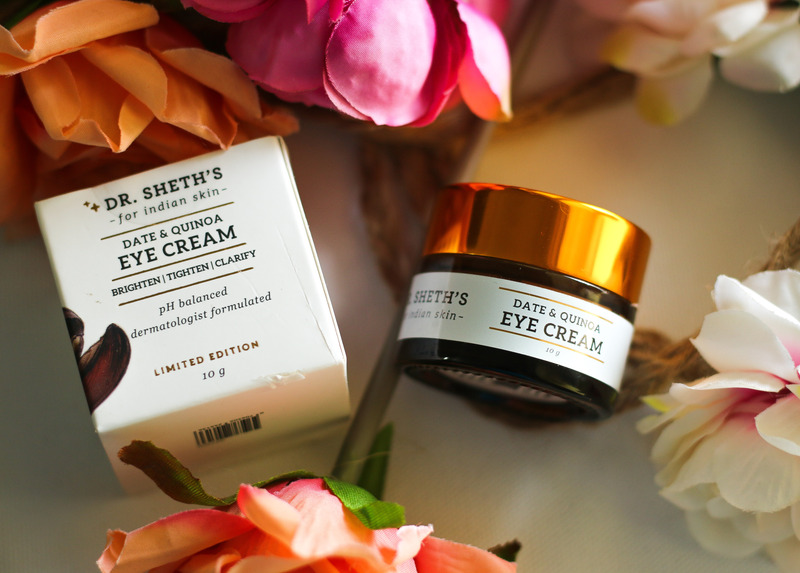 In today’s post, I am going to brief about one of my current favorite under eye cream. A formulation that I have never seen in any other Made In India eye creams. 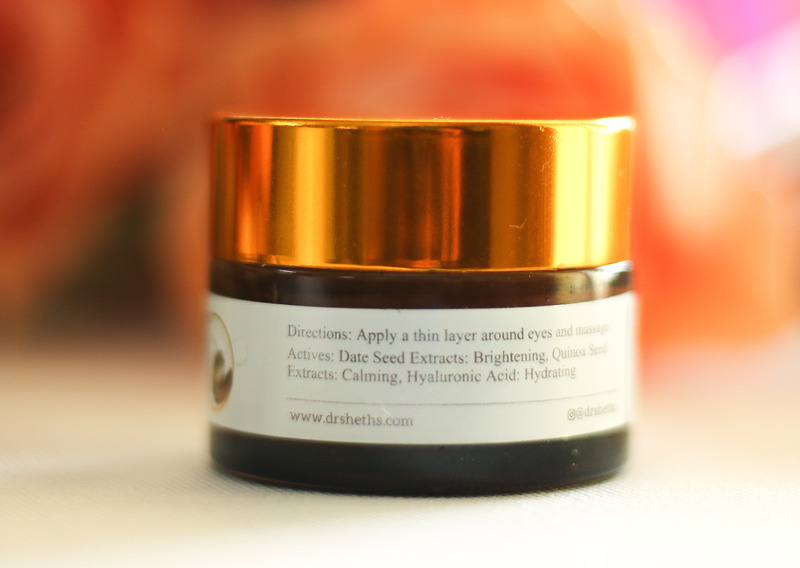 A formulation that is tested on Indian Skin. 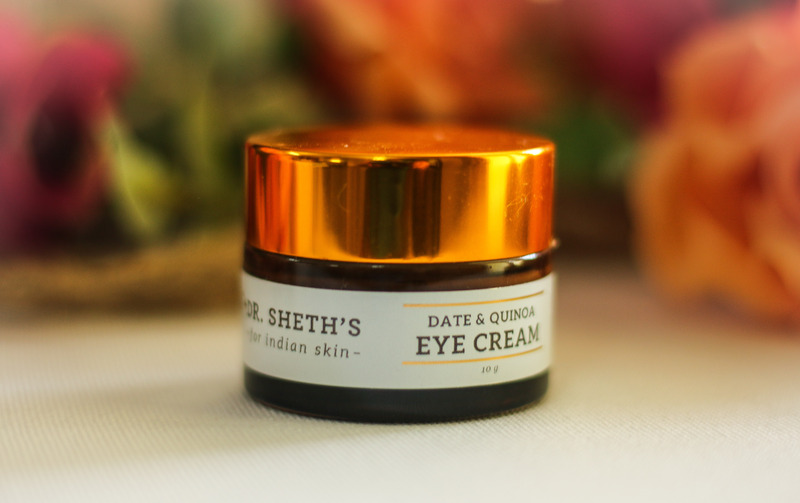 Dr. Sheth’s Date & Quinoa Eye Cream has become my most used eye cream since past 2 months. 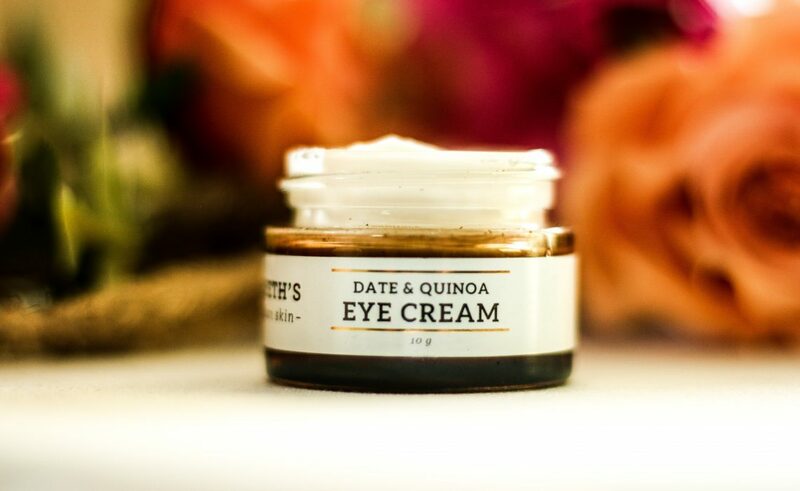 Unlike most eye creams, this has been formulated with super foods date and quinoa seeds, hyaluronic acid, shea butter and niacinamide. These not only strengthen the thinner under eye skin, but also help in treating dark circles, fine lines and puffiness. 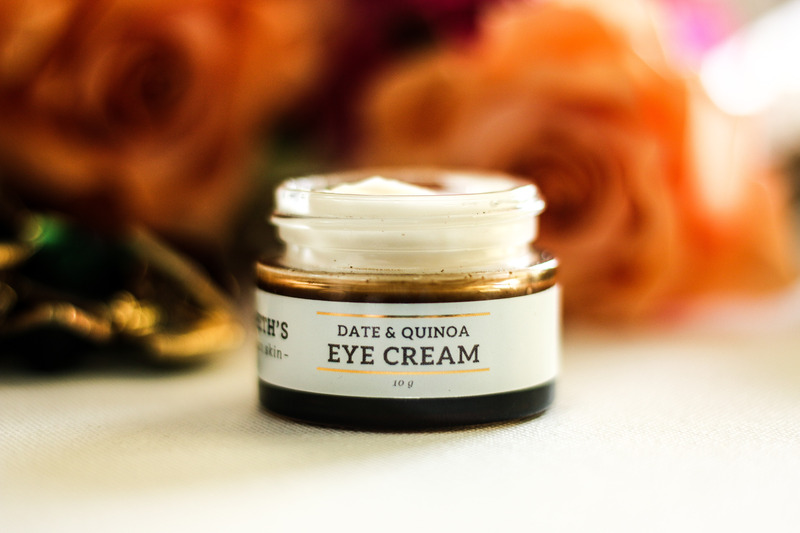 Quinoa and date seed address multiple causes of under eye circles – they diffuse the blood vessels and battle pigmentation to result in a clearer, brighter look. The hyaluronic acid and shea butter make sure the skin stays hydrated and is strengthened to battle the harsh effects of pollution. Nt Wt – 10G ; Price – INR 899. Comes in this cute lil jar. I love the consistency of this eye cream. It sinks into the skin without leaving any residue. The first thing I noticed about this eye cream is its impressive ingredients. I have never used any cream with date, quinoa etc. Knowing the health benefits of them I was so excited to see for myself what change it is to bring to my skin. To talk about my under eyes. I have deep set eyes and also my light layer of dark circles are hereditary. And, the area under my eyes look tired or darker when I am not getting enough sleep or if I am stressed out. Regular usage of wonderful skincare products that I use had made a big difference in the way my under eyes look. During pregnancy, I had to let go of some of the great skincare brands that worked well for me. Post pregnancy, sleepless and stressful nights brought back my old under eye area. 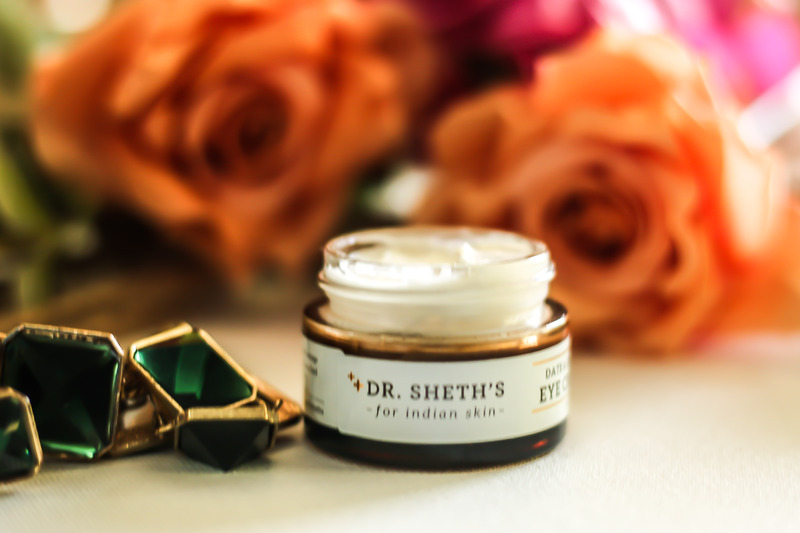 It looked darker than it really is and so, I was in search of a good product and that is how I came across this eye cream from Dr. Sheth’s. Having used their other skincare range, I had high expectations about this eye cream. 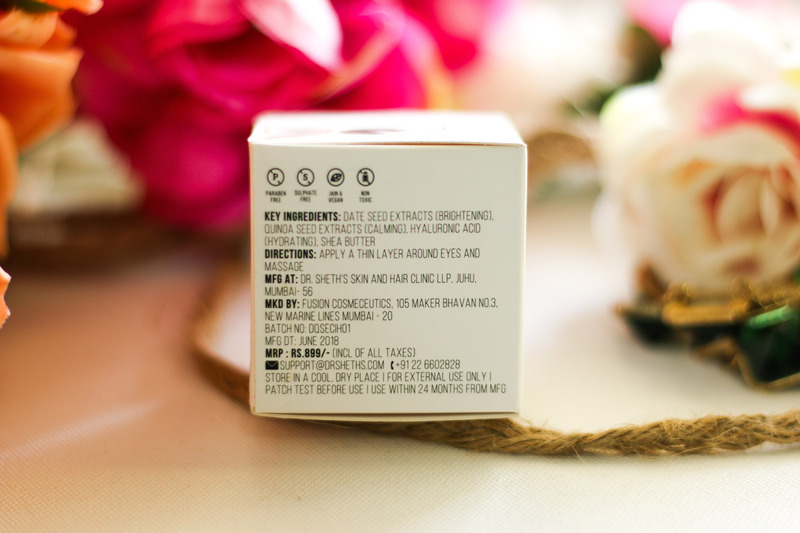 How I used it – After my regular cleansing and toning, Before applying my facial moisturizer, I take a teeny bit of this eye cream and apply it in a thin layer under and around my eyes. I use my trusted Jade roller to slightly massage under and around my eye area.Now, this routine is not limited to nights. Whenever I get time I apply this cream. Massaging using my jade roller along with this cream itself gave a cooling sensation on the area around my eyes. The consistency of this cream is good. It gets absorbed without any residue and that’s something which I like. The area around my eyes looked more plumper, My usual tired eyes looked better. Read as if I got a good night’s sleep. The area appeared more hydrated, radiant etc. I think the magic ingredients dates and quinoa seeds, hyaluronic acid, shea butter and niacinamide together worked like a charm. “Niacinamide has not been formally assigned to a pregnancy category by the FDA. Only a small amount of topically applied niacinamide is absorbed, so it is considered safe during pregnancy.” But, It’s always better that you check with your doctor before using this cream if you are pregnant or if you are a nursing mom. Now, coming onto some of the usual questions that you all might ask me. Will this banish dark circles ? Using an eye cream alone won’t banish dark circles, but Yes, some of the hero ingredients in your eye cream can noticeably reduce the way the area around your eyes look,. 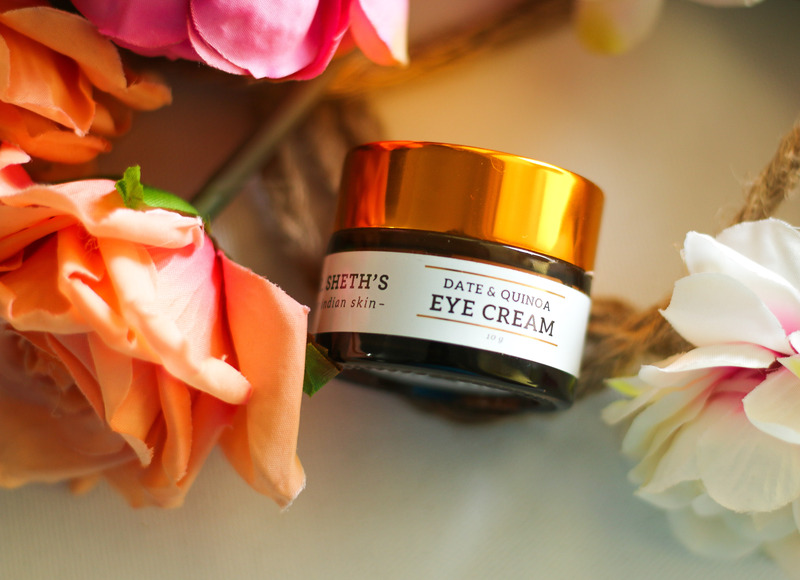 A effective targeted under eye cream can constrict blood vessels (which cause dark shadows), diffuse light, and brighten pigmented areas for a noticeable improvement in their appearance. Overall, its an excellent eye cream that’s made of some of the hero ingredients. 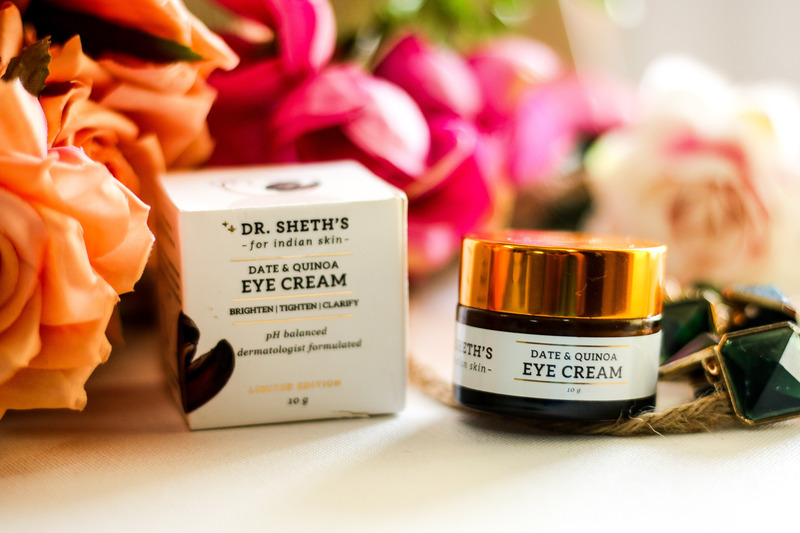 So, My current eye care routine mainly consist of two products – For day time – I use the The Ordinary Caffeine Solution 5% + EGCG and for night time, I use this Dr. Sheth’s Date & Quinoa Eye Cream. Skin feels refreshed and lifted with enhanced hydration and a more even tone. I love the results on my under eyes and I am sure this small jar is going to last for a long time considering I need only a pea sized amount every time. It sits well under makeup. Skin texture around the eyes got improved, reduced puffiness and looked under eye area appeared more plumper. Skin lightening niacinamide supressed the dark shadows and area appeared radiant and smooth. 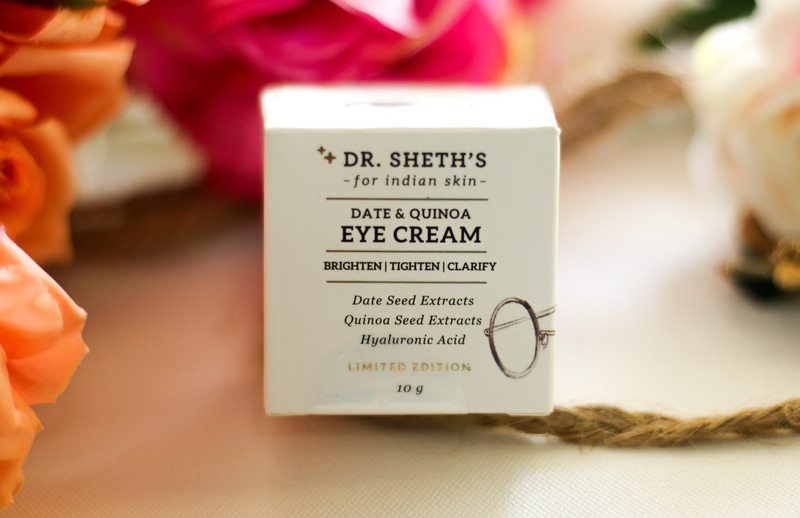 Have you used Dr. Sheth’s Date & Quinoa Eye Cream ? What’s your favorite eye cream ? ** Product send by brand for review. However, my review is honest and unbiased as always. Do try dear..You will love it! I have never tried any eye cream but after reading the ingredients n your review.. I’m surely going to give it a try.. I need an eye cream for my dark circles. This looks so good for taking care of the eye area.